Formerly known as Ophira International Airport, Sharm el-Sheikh International Airport is an international airport located in Sharm el-Sheikh. Initiated in 1968, Sharm el-Sheikh International Airport is the second busiest airport in Egypt handling over 7,430,940 passengers annually. The main airlines operating at Sharm el-Sheikh International Airport are Adria Airways, Air Italy Egypt, Atlant-Soyuz Airlines, AMC Airlines, Condor, Hamburg International, Meridiana Fly, Thomas Cook Airlines Belgium, UTair-Ukraine, etc. This airport presently has two modern passenger terminals and the third terminal is under construction. The main facilities offered at the airport includes cash dispensers, currency exchange facilities, restaurants, snack bars, several shops offering products like newspaper book store, jewelry and souvenir shops. The travelers can easily travel to or from the airport by hiring a car with Egypt Cars Rental. Sharm el-Sheikh International Airport serves the Sharm el-Sheikh which is popular resort town. Situated on the southern tip of the Sinai Peninsula in Egypt, Sharm el-Sheikh attracts tourists from all over the world. Sharm el-Sheikh is one of the finest diving spots in the world and is very popular among the scuba divers. The perfect climate, memerxing landscapes, excellent range of restaurants, hotels and cafes, fascinating beaches and numerous fun water sports makes Sharm el-Sheikh a perfect place to spend a great holiday. The tourists can enjoy a thrilling nightlife at Na'ama Bay which houses the popular cafes, restaurants, night clubs and shops. The reefs of Tiran and Ras Mohammed are the two best diving-spots in the world and the travelers can easily reach there in a boat. 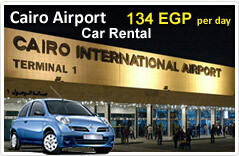 Egypt Cars Rental is one of the leading car hiring companies having rental locations throughout Egypt. Renting a car with Egypt Cars Rental is the easiest and the most inexpensive way of commuting. At Egypt Cars Rental the travelers can get luxurious car hire service at the most budgeted rates.